A few walking trails are provided. For those who want to go off the beaten path, be sure to carry a compass and tell someone where you are going. The parks connect Merritt, Princeton and Keremeos and are located off of Highways 3 and 5A. This 144 hectare park is located 38 km south of Merritt. It is in the center of BC's cattle country where open forests and sloping grasslands are typical of the area. A 61 site campground provides water, firewood and toilets. A cartop boat launch makes easy access to the lakes where fishing for rainbow trout can prove rewarding. Four km of walking trails provide access to the lakeshore and the park's scenic surroundings. The park is located west of the Cascade Mountains, 22 km northwest of Princeton. The mining history of the area makes sight-seeing an interesting activity. There are 45 campsites available with toilets located nearby. There are 2 boat launches provided. Fishing and water skiing are favorite activities on the lake. 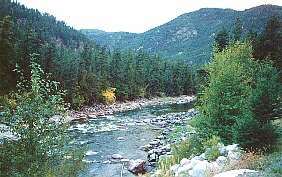 Both parks are located on the Similkameen River along Highway 3, east of Princeton. Bromley Rock Park has 17 camsites and a large day use facility with water, wood and toilets provided. The area is perfect for swimming, picnics, fishing, canoeing and hiking. Stemwinder Park has 27 campsites with toilets, water and firewood provided. It is also an excellent place for canoeing, fishing and picnicking.